THERE ARE A DOZEN OR SO CONSIGNMENT ESTABLISHMENTS HERE IN SANTA FE. WHY WOULD YOU OPEN ANOTHER? 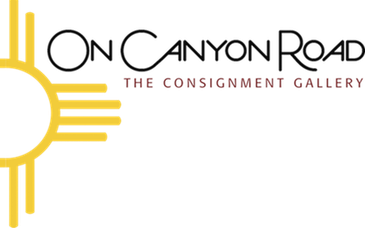 We opened ON CANYON ROAD to serve the needs of consignors and shoppers who were seeking a venue for fine art and fine furnishing exclusively. That’s what we do and it’s all we do. YOUR LOCATION IS AWFULLY PROMINENT, BEING RIGHT AT THE INTERSECTION OF CAMINO DEL MONTE SOL AND CANYON ROAD. WHY THAT LOCATION? It suits perfectly the image we wish to project, and it is representative of the consignments we seek and the shopping treasures that can be found. WITH SUCH A PRESTIGIOUS LOCATION, CAN YOU AFFORD TO OFFER CONSIGNORS AN ATTRACTIVE FINANCIAL ARRANGEMENT? We think it’s the best in town. Consignors are paid 60% of the selling price for sales in the first 30 days, and 50% thereafter. Checks with detailed statements go out no later than the 15th of the following month. I SEE THAT YOU SPECIALIZE IN FINE ART RESALES. IS THAT UNIQUE, AND IS YOUR INVENTORY VARIED? We are, first and foremost, a fine art brokerage and we handle all mediums, all artists, all genres, from all periods. We only handle original art, however, and our highly experienced art team is second to none. ART INSTALLATION WOULD BE A HELPFUL SERVICE. DO YOU OFFER IT? We sure do. Our experts can hang paintings and install 3-dimensional works to museum standards. WHAT KINDS OF FURNITURE DO YOU CONSIGN? We are open to considering all furniture, lighting, rugs and accessories that meet our quality, size, and valuation standards. Our inventory is beautifully staged to enhance the shopping experience, and consists of wonderful antique and vintage treasures, to mid-century modern, traditional and contemporary selections. A DRAWBACK OF SOME CONSIGNMENT SHOPS IS THE CHALLENGE OF GETTING ITEMS TO THE STORE, AND GETTING PURCHASES HOME. WHAT DO YOU OFFER? We have a specially-equipped van and offer complimentary pickup of approved consignments. Shoppers will appreciate our timely and affordable delivery services within 50 miles of the gallery. IS YOUR TEAM CAPABLE OF HANDLING AN ENTIRE ESTATE? We are, and we are asked to do so quite regularly. We classify and prioritize the inventory, move key items to the gallery for immediate display, store seasonal items in our warehouse for later staging, and even transport excess to other consignment venues and donation centers at the client’s option. HOW LONG IS YOUR CONSIGNMENT ARRANGEMENT, AND WHAT HAPPENS IF AN ITEM DOESN’T SELL? We showcase and professionally represent consignments for 90 days, and in the unlikely event an item doesn’t sell we will help facilitate its return, its relocation to an alternative venue, or its donation. We do. Smaller items are carefully packed at the gallery and shipped via an express ground carrier. Larger items are blanket-wrapped and sent to their new homes with private carriers coast to coast.